ATTLEBORO, Mass. – The parking lot was packed on Saturday afternoon, fans forced to make the trek up to the New England Sports Village from the street, and the stands were filled to the brim for a battle of neighbors. Bishop Feehan’s reaction after pulling out a 1-0 win over North Attleboro matched the atmosphere pulsating down from the crowd. 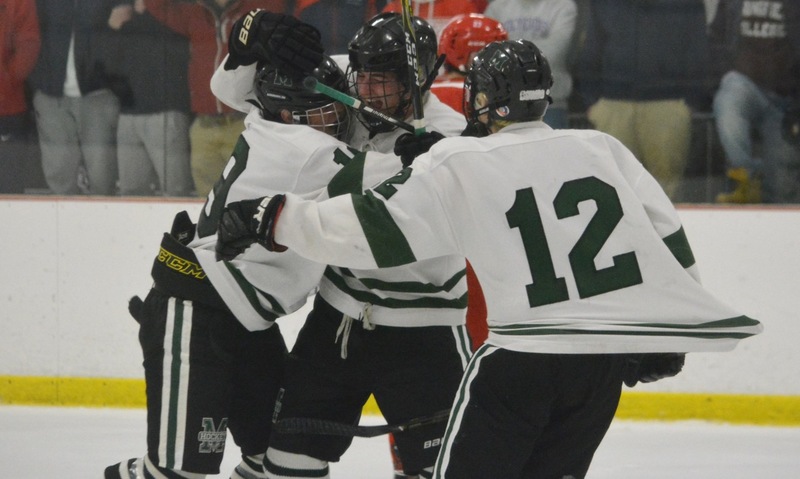 Feehan’s players swarmed each other at the final horn, while North players dropped to the ice in anger and frustration. This felt like a Div. 2 playoff game, not one being contested before Christmas with the teams having played only a handful of games between them. Having had a week off between its opening game against Oliver Ames and its meeting with Feehan, North took a while to get its skates under it. Senior goalie Ryan Warren (26 saves) was on top of his game, however, and held the Shamrocks off the board during a dominant opening period. 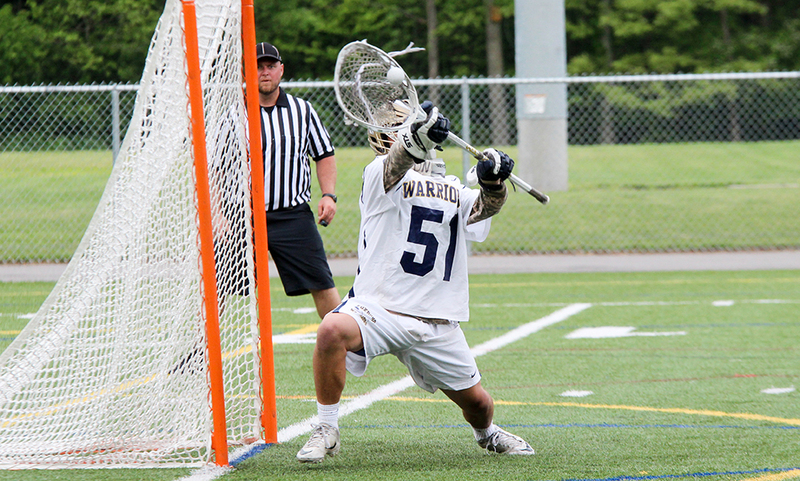 Warren made nine saves in the first, while the Rocketeers managed only three on the other end. Just two minutes into the game, Warren was forced into a big pad stop to deny Ben Gaucher as North freshman defenseman Austin Comery chased back to hassle the Feehan forward. With six minutes left in the first, Warren got a big helping hand from his defense. After Warren was knocked out of goal making a save, junior Jeff Baker reacted first to clear a loose puck off the line. Warren was caught wide of the goal in a mass of bodies and the puck went out to the point, Comery stepped in front of a goal bound shot to prevent the opening goal (in the process suffering an injury that forced him out of the game). Feehan continued to attack and Gaucher had another chance with a tip on the edge of the crease but again Warren managed to get his pad across to make the stop. North’s first good scoring chance came early in the second when Dennis Morehouse dragged the puck through a pair of defensemen and was stopped from a tight angle. A minute later, the Rocketeers were positive that they had the lead. John Connolly got free in the slot and his shot clanged off a post and out towards the corner. North was sure that it hit the back of the net and everyone seemed to pause for a second but there was no signal from the officials. Feehan had its fair share of chances to grab the lead as well. A minute into a penalty kill, North was given a major penalty, meaning 50 seconds of a two-man advantage and then more than four more minutes of power play to kill. C.J. Botelho had a pair of chances, one saved by Warren and the other that he sent wide of an open net, and Jack Murphy’s shot from the point was redirected in front by Kevin Barrera but Warren managed to keep his pad on the ice to keep the shot out. Surviving the long power play opportunity seemed to spark the Rocketeers into life. Jake Ebert had a good chance right after North got back to even strength and Will Yeomans had a shot from the point kicked aside. With 90 seconds left in the second, Todd Robinson backhanded a pass across ice to Connolly, who rode a check and managed to get a shot on net. It was a good flurry for North in the attacking zone and foreshadowed a strong third period push. After being outshot 20-11 through the first two periods, North outshot Feehan 14-7 in the third. Anthony Zammiello saucered a pass to Robinson on an odd-man rush and the senior forward forced Feehan goalie Rory Geraghty into a shoulder save. Connolly had another chance from inside the left circle but that was stopped too. 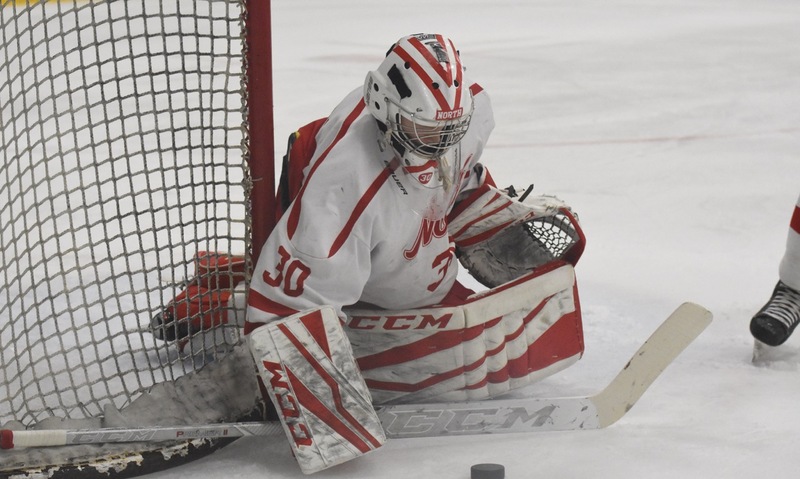 Warren was forced into two big stops on the other end to keep the game scoreless and North broke up ice quickly with Justin Moccia forcing Geraghty (24 saves) into another stop. The chances kept coming for North, which was in control of the period, including a series of close calls on a power play opportunity with four minutes left. But, with just 1:43 on the clock, Feehan managed to find one good scoring chance and made it count. Kevin Borah roofed his shot as he cut across the crease to give the Shamrocks the lead. North had one more great chance when Robinson, despite Feehan going on the power play during a scrappy closing sequence, got behind the Shamrocks defense but Geraghty stood tall again and made a solid pad save to deny the breakaway and the opportunity for a tie. North Attleboro (0-2) will be back on the ice on Thursday afternoon at Levy Rink when it opens the Burrillville (R.I.) Hockey Winter Classic against Cumberland (R.I.). 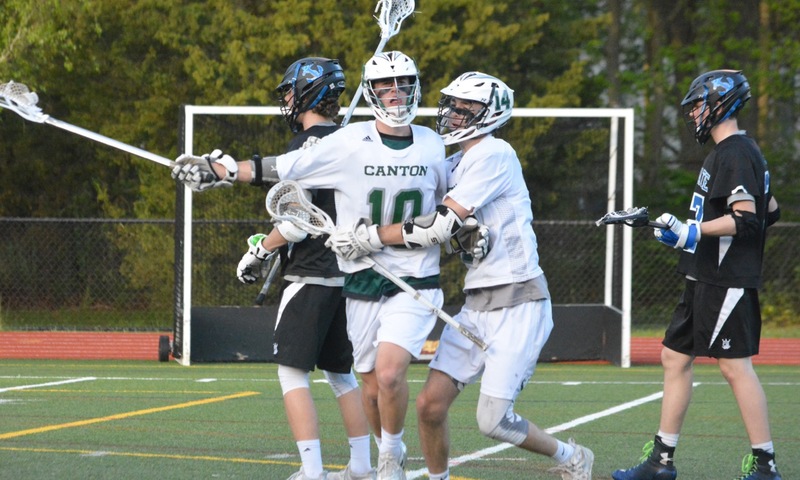 Attleboro, 0 @ Canton, 6 – Final – Canton junior Ryan Nolte scored a pair of goals and had an assist to help the Bulldogs beat Attleboro. Johnny Hagan opened the scoring to give Canton a 1-0 lead after the first. Jack Connolly, Timmy Kelleher, and Bubba McNeice each scored once in the win. Foxboro, 5 @ Taunton, 5 – Final – Click here for a recap of this game. 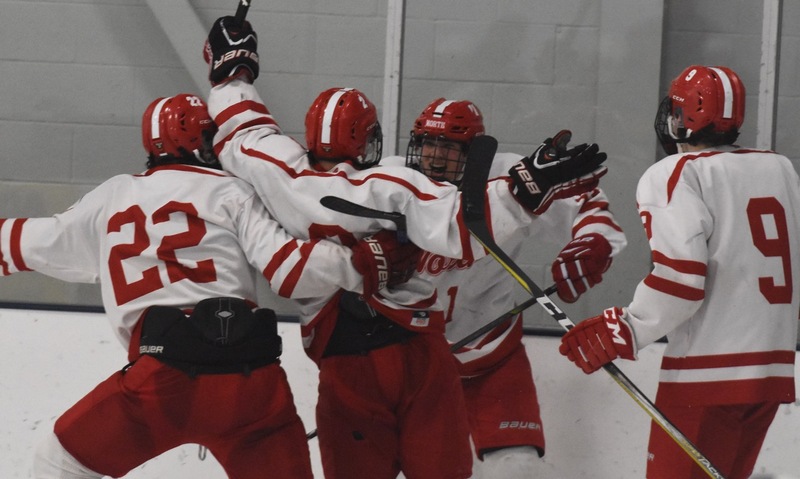 Franklin, 4 @ North Attleboro, 3 – Final – North Attleboro took a 1-0 lead in the first period, but Franklin scored twice in each the second and the third periods to earn the win. Jeremy Miller, Joe Lizotte, Scott Elliott, and Luke Downie each scored once for the Panthers. Will Yeomans (from Jake Ebert), Jason McNeany (from Jake McNeany) and Brendan McHugh (from Jason McNeany) scored for the Big Red. Oliver Ames, 10 @ Stoughton, 1 – Final – Oliver Ames sophomore Jake Gottwald scored a pair of goals while sophomore Brad Powers, junior Adam Lyons, and freshman Ross Carol each netted their first career goals. Canton, 9 @ Stoughton, 0 – Final – Canton’s Ava Pacitti earned her her first career shut out, making 12 saves for the win. Franklin, 0 @ King Philip, 1 – Final – Nicole Conner scored the game’s only goal to lift KP to a Hockomock win. Taunton, 3 @ Franklin, 66 – Final – Taunton’s Woudanly Danger earned the Tigers’ lone win, coming away with a victory at 220. Oliver Ames, 33 @ Mansfield, 41 – Final – Click here for a Photo Gallery from this meet. Sharon, 40 @ Milford, 34 – Final – Sharon got pins from Sam Mandelbraut (132), Matt Callan (145), Dimitri Kalogeras (220) and Justin Wells (285), and a win via major decision from Tyler Cashton (152) to beat the Hawks. NORTH ATTLEBORO, Mass. 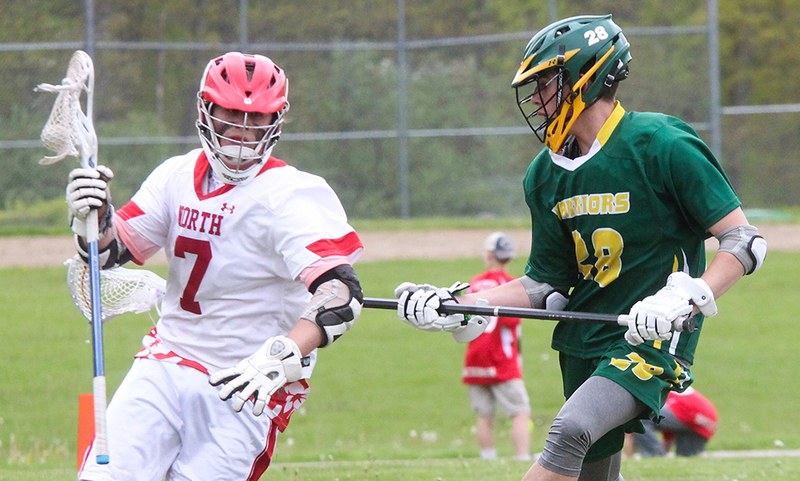 – Back in April, North Attleboro boys lacrosse saw its second half comeback effort against King Philip fall just short. Fast forward to Friday afternoon where no come back was necessary. In fact, the Rocketeers were in driver’s seat the entire way, racing out to an early lead and never looking back to pick up a convincing 10-3 win. With the win, North Attleboro clinched at least a share of its first ever Davenport division title; also the program’s first ever league title. While the Rocketeers were limited to just one goal in the first half of the first meeting between the two, it took North just one quarter to find the back of the net three times. In the first minute of play, Owen Costello found some space and then found the back of the net to put North up 1-0. The Rocketeers continued its strong start when Zach McGowan found Nick Moore in front for a bounce shot less than four minutes into the game. Big Red’s lead grew to three shortly after with McGowan again assisting. This time the senior connected with Tommy Lindstrom for a man up goal. King Philip’s Tim Watson found Colin DeVellis with a perfectly weighted pass over the goal and the sophomore finished to bring the Warriors within two by the close of the first quarter. North Attleboro tacked on two more goals in the second quarter with McGowan having a hand in both of them. First, the senior attack took control of possession, dodged around and defenseman as he raced from behind the net. McGowan released a shot as he curled toward goal and found the back of the net top shelf. Minutes later, McGowan connected with Costello as he eluded his mark in front for a quick goal to make it 5-1 heading into half. The Rocketeers continued to build their lead into the second half. After neither side scored for the first eight minutes, Colin Young found the back of the net on a feed from Jack Dakin. Moore grabbed his second to put North up 7-1. King Philip had an answer when Watson recorded his second point of the game, sneaking one in from a tight angle to cut it to 7-2. If there was any hope for a comeback, it was quickly erased when North scored in transition just one minute in. Freshman Will Yeomans scooped up a loose ball and raced into the attacking zone. When he defense committed, he dropped the ball off to McGowan for an easy finish in close. King Philip cut it back to five when Aidan Bender converted a feed from John DeLuca, but that would be the Warriors’ last tally. Young grabbed his second on a nice tic-tac-toe play with passes coming from Moore and McGowan. Dakin then found the back of the net from distance after a simple pass from McGowan. McGowan (two goals, five assists) paced North’s offense with seven points. “He’s controlling our offense,” Young said. “He’s smart, he calls the right plays all the time. If he gets the ball and controls the ball, we’re in much better shape. He’s just calm with the ball. Friday’s game marked the lowest offensive output of the season for King Philip. 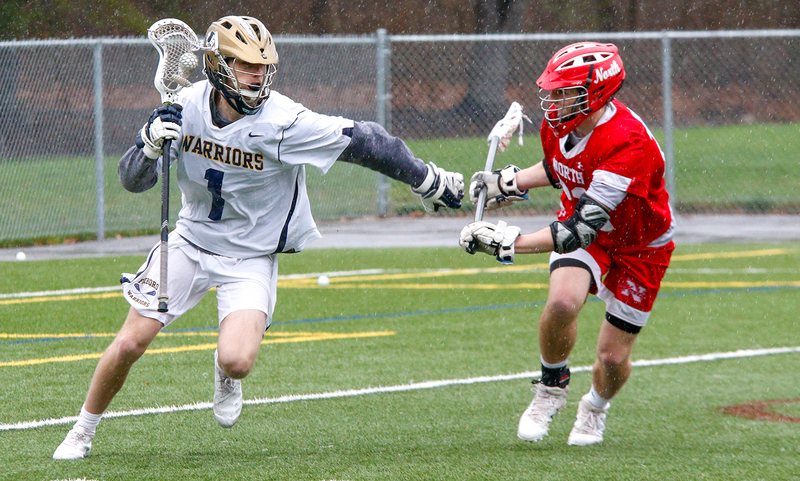 Defensemen David James, Tom Lockavitch and Brett LaBonte, along with LSM Max Fontes and midfielders Nick Moore and Paul Yeomans prevented the Warriors from building any momentum. Goalie Dan MacDonald registered 14 saves for Big Red. North Attleboro boys lacrosse (11-2 overall, 8-1 league) is back in action against Attleboro in a non-league game. The Rocketeers can win the Davenport title outright with either a win over Mansfield or Stoughton, or a loss from Foxboro. King Philip (10-5, 7-2) is back in action on on Saturday, hosting Walpole.